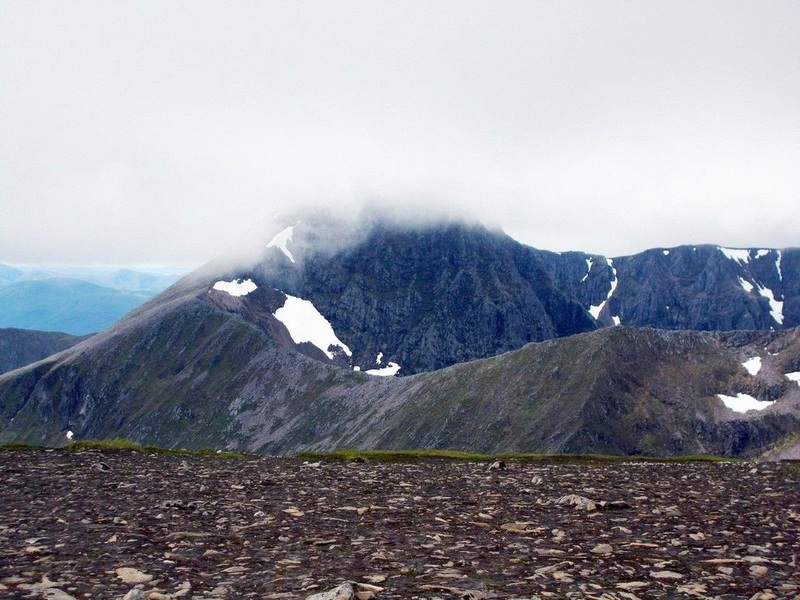 Ben Nevis at 4409ft or 1344m is the highest mountain in Scotland and the UK. 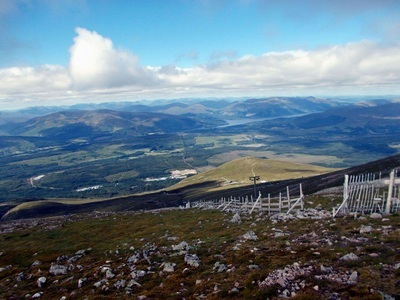 As a consequence of this the normal tourist route to the summit is busy throughout the summer but there is more to these mountains than the endless trail of stones leading from the car park near Fort William to the usually mist shrouded summit. Head instead to the Nevis Range ski area a few miles north of Fort William on the road to Spean Bridge - gondola and mountain bike trails in summer - and two more Scottish "four thousanders" are easily accessible without following any crowds - I saw only a dozen or so people once I'd left the gondola station behind. 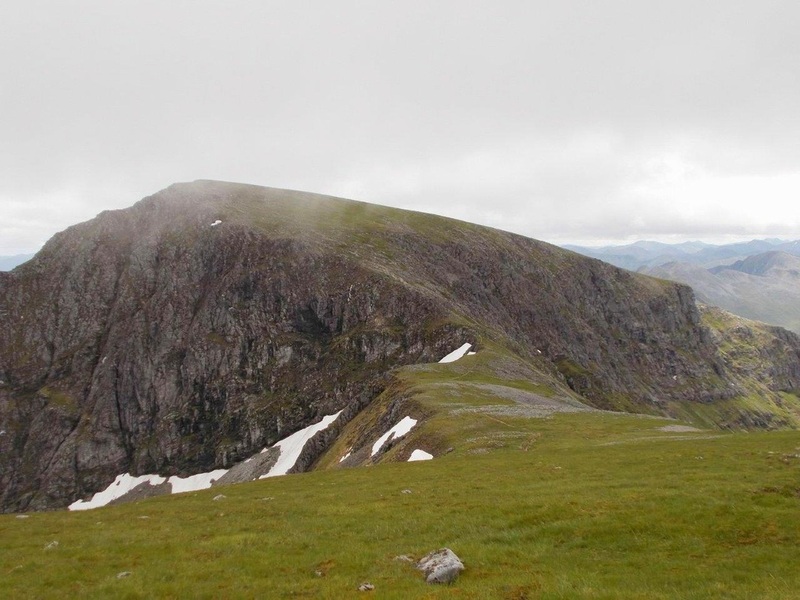 These summits - both Munros (Scottish mountains over 3000ft) - are Aonach Mor (1221m/4006ft) which rises directly above the ski area and the more remote Aonach Beag (1234m/4049ft) that overlooks the upper reaches of Glen Nevis and the normally unseen side of the Ben. The gondola ride (which cost £12 return) is a worthwhile activity in itself especially with kids or if you're not feeling particularly energetic and it took me over the forest and the open mountainside above to a height of 2150ft and some awesome views of the Western Highlands. It's worth mentioning that a couple of mountain bike trails leave from here - the red downhill which looks awesome and which I might attempt next time and the suicidal looking World champs downhill which I'll definitely not be attempting - it's a steep black descent with big rocks and jumps so only for experts! 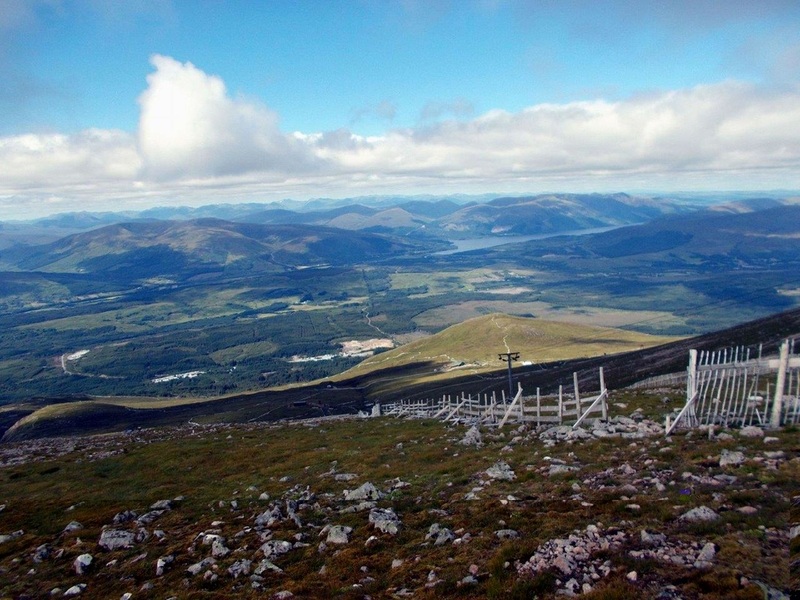 There is a viewpoint a short distance from the top station that's well worth a visit so after this I set off to climb Aonach Mor which is the eighth highest mountain in Scotland and the UK. Returning to the station I followed the wide track roughly south going under a chair lift - these only run in the ski season - and approaching the edge of the plateau where I branched off left and uphill before reaching another viewpoint. The going was fairly hard at first as there is no real path for the lower section but I headed up to the right of the ski lifts. Soon though a faint path appeared and became more distinct as I got higher, passing the building marking the top of the chairlift and then reaching the top of the ski area itself. Here I sheltered from the cold wind behind a hut - it was only 3-4 degrees above freezing and snow showers were forecast at this height despite it being July. Ahead the path led out across the tundra landscape of the high plateau that makes up the top of Aonach Mor. It is really a very wide ridge leading south and "Big Ridge" is the translation of the Gaelic name. 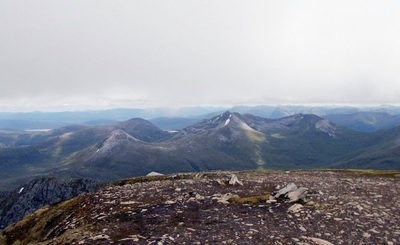 With views of the unfamiliar side of Ben Nevis looking distinctly alpine to my right I crossed this high barren looking plateau without climbing very much to reach my first summit which was marked by a large cairn 4006 feet above the sea which was visible away beyond Ben Nevis. Ahead the ridge narrowed a little before rising up to Aonach Beag - "The Little Ridge which is actually slightly higher. My way led down an easy slope on a wide path to the bealach or col between the two peaks where deep drifts of snow filled the eastern corrie. Aonach Beag rose imposingly ahead and from here looked as though some scrambling might be needed to reach it but aside from being steep and rocky the way was easy and passed an interesting feature that reminded me of a mini Napes Needle for those familiar with Great Gable in the Lake District. On most mountains at the point where you think the top is near it comes into sight still a long way off but here, as the path begins to level out, the summit is revealed just ahead and the views to the South of which we've seen only tantalizing glimpses are revealed in full. 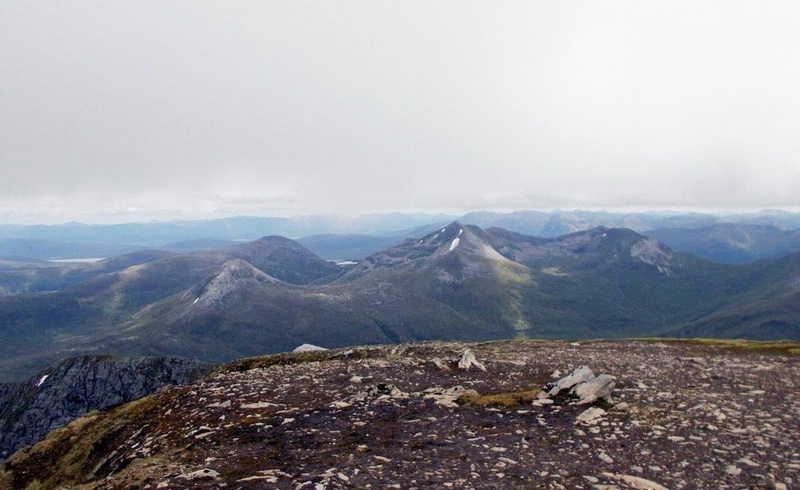 From this lofty vantage point the eye was drawn to the mysterious ridges of the Grey Corries in the East and over the wilderness of Rannoch Moor. Closer at hand the ridge of the Mamores was seen across the depths of Glen Nevis while the Ben itself towered just to the West, its peak in cloud. Heading back, Aonach Mor appeared of gentler character though a journey along the eastern edge of the plateau between the summit and the ski area reveals vast sheer cliffs falling to a beautiful lochan or tarn far below - an aspect of the mountain completely unseen from the ski area. Having paused to admire these views I returned to the top of the ski area just as the weather began to clear and headed down to the warmer zones below where it was still summer. This route contains no difficulties under "summer" conditions though in bad visibility it's important to remember that the wide easy ridge of Aonach Mor has steep drops along both sides as does Aonach Beag. 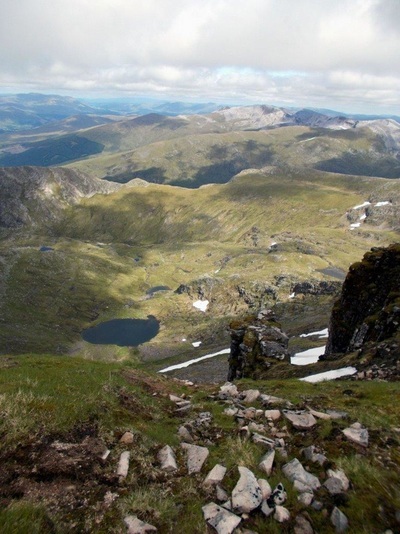 There is a route off to the west from the bealach between the two Munros to the lower gap (822m) between here and Ben Nevis with acess to Glen Nevis or the north. Only attempt this in bad visibility if you know it. Equally a route ascends Aonach Beag from Glen Nevis but I've not done it - that side of the mountain is precipitous and of alpine scale so again research those routes before attempting! As for the walk described here; its 12km or a shade under 8 miles return from the top gondola station and has almost 900m/3000ft of ascent and descent. Not using the gondola adds 600m/2000ft and so makes for a much longer outing.